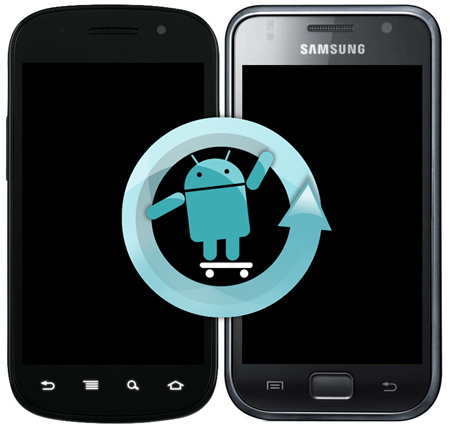 For those of you using the Nexus S by Samsung, you’ll probably have access to the newest Android OS (Ice Cream Sandwich) way one or the other. Thanks to CyanogenMod 9, you’re able to get an early preview on your devices now. The newest alpha is by no means the last, but it runs smoother and faster than its predecessors. There is a beta version of CM9 for Galaxy S users too, and it seems to be fully functional. Unfortunately there are many reports that the software completely wipes out the user’s SD card. We won’t be able to recommend it until that portion is solved. There’s a few fixes in the new build including adding missing dictionaries and removing duplicate keyboards. The build is ready for daily use and adds Google Wallet Support for your device. You can get the above files from this thread. Step 1: Hopefully you’ll already be running an earlier version of CyanogenMod. If you are, skip to Step 3. If not, proceed to Step 2. Step 2: Root your Nexus S or Galaxy S, you might have to Google around for the latter. It’s an easy task but with quite a few steps. Return to this guide after your devices is rooted. Step 3: Be sure ROM Manager is installed then open it on your device. Verify that ‘ClockworkMod Recovery’ has the latest version installed. Step 4: Back up your data. While still in ROM Manager, scroll down and select “Backup Current ROM”. Once completed the backup can be found in your SD card under ‘clockworkmod’ directory. It may be a good idea to transfer this data to your computer in case you need to restore to an earlier state. Step 5: Install ICS by selecting “Install ROM from SD Card” in the ROM Manager menu. Step 6: Select “Wipe Data and Cache”. Step 7: Select “Wipe Dalvik Cache”. Step 8: Repeat the Steps 3 to 7, but this time with the Google Add-on files. Your phone will automatically restart. After it reboots, you’ll be welcomed by the Ice Cream Sandwich set up screen. Remember, since this particular build is pre-rooted, you’ll have to restore from backup if you wish to revert to the Gingerbread version. For now, the build seems to be working great.